Students will create an original narrative in the form of a Choose Your Own Adventure interactive story. During the 1980s a series of books called “Choose Your Own Adventure” entered libraries with a new concept of giving the reader the power of choice about how the story would turn out. These were popular with many students, and at most school libraries there was a waiting list to check these books out. As we move further into the 21st century, publishing companies are looking for ways to engage the digital generation in reading. Using what you know about the topic you are studying, design a digital choose-your-own-adventure story to engage readers at your school. Take some time to explore a few “Choose Your Own Adventure” books and online hypermedia stories with your class to give students a better understanding of how these stories are structured. By now they are familiar with the elements of a story: setting, character development, plot structure, conflict, and point of view, and this will provide an opportunity for them to apply what they know. Working with the topic of your choice, have students brainstorm ideas for writing an interactive story. Students can use a thought web to express a variety of ideas for their story, starting with a central theme to drive the adventure and developing several alternate endings. The interactive story they are writing could have two tiers of choices with four possible endings, or three tiers of choices with eight possible endings. Which ideas will be the easiest to come up with eight endings? What choices will readers need to make in order to transition from one part of the story to another? Will there be drastic differences with the direction of the adventure and the choices made by the reader, or will it be consistent throughout? Once students have thought about the direction of their story, have them use a storyboard or flowchart to create a summary of where the story choices will go. Have students write a draft of the story and share with another student to edit and provide feedback. Revise as necessary. When the storyboard and script are complete, have students begin looking for potential images, music, and sound effects that will support their story setting and plot. Since this style of story is different than traditional text, the use of visuals and sounds will be important. Students may want to gather copyright-friendly images from a website like Pics4Learning.com. They could also use a digital camera and image editing software to capture and edit their own images. 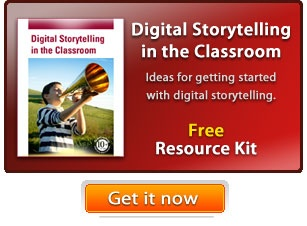 Students may also want to consider sound effects and narration, which are limited to one per page. During this process it is helpful for students to store all of the media resources in a folder on the computer or server. Be sure to remind students to add citations for all media elements to their bibliography page. Have students use the tools in Share to add media elements to each page of the story and create navigation between the pages. If this is the first time students are writing an interactive story, you may want to use the “choose your story” template in the templates folder. Contact your local library and find out if the librarians or volunteers will partner to evaluate student project work. Local bookstores might even be interested in hosting a storytelling night where students can share their adventures with shoppers and community members. Giving students a platform outside the classroom walls empowers them to apply themselves at a much higher level. You may choose to assign multiple grades or credits for the project, including points for writing a clear and effective adventure, overall design, time management, and creativity of the story. The graphic organizers are also a great way to assess if students are on track or if you need to go back and instruct on the different elements of the project. 5. Analyze the structure of texts, including how specific sentences, paragraphs, and larger portions of the text (e.g.,a section, chapter, scene, or stanza) relate to each other and the whole.